Graphic shows a race / ethnicity survey question with many options, including Black, White, Native American, Chinese, Korean, etc. 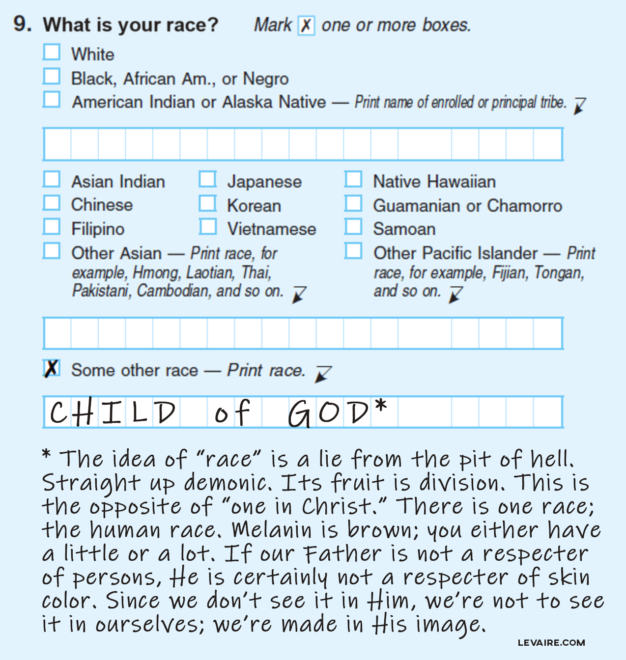 In this case, “Other” has been selected and “Child of God *” has been entered below. I’m betting Adam and Eve were of one skin color, since they were of one flesh (Genesis 2:22). That means skin color variances–like other environmental adaptations–came after the Fall. The notion of different races is a demonic construct. We’re all born out of the physical lineage of Adam and Noah (Luke 3:23-38), and believers are born again into spiritual adoption through Jesus Christ, by faith (Romans 8:14-17). This is not to say we are all the same. Some are hands, feet, mouths, etc. (1 Corinthians 12:12-26). Let’s get our eyes off our skin and get our eyes on Him.